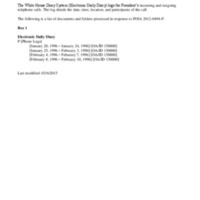 This collection consists of a detailed report of phone calls to or from President Clinton for each day between January 20, 1996 and February 10, 1996. The logs detail the date, time, location, and participants of the phone calls. In this specific date range, phone calls to or from various White House staff, advisors, senators, congressman, governors, mayors, Cabinet secretaries, and Foreign Heads of State are noted.